The Internet of Things is upon us. Vast amounts of big data are quickly approaching and network traffic, latency and bandwidth are at higher demands than ever. Storing, transmitting, and analyzing this data from IoT devices will require a secure and agile network architecture. Network failover and network security will be of the utmost importance. How will these changes in demand and technologies have an impact on new standards and protocols? Will network communications between devices and the cloud be safe? 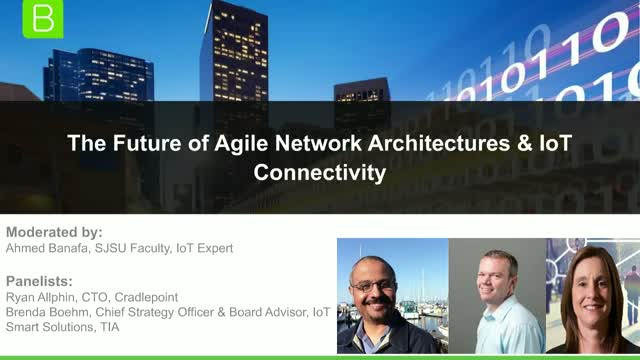 Tune into this dynamic panel discussion with leading IoT and network experts for the state of IoT networks. Join the FOTC's Cindy Montstream for our annual update on structured cabling standards. Attendees will earn one BICSI CEC. From there the presentation will move on to the calculation of a loss budget, what is the correct budget, and what wavelengths should be tested. We will look at the best practices in Tier I loss testing to assure the minimum of uncertainty in our test results. The presentation will explain how this can be done for both single connectors such as LC and SC as well as MPO connections. Finally, we will look at troubleshooting the fiber using an OTDR and give an introduction to the identification of common events in Single Mode OTDR traces. Smart buildings are the building blocks that will enable society’s digital transformation. This revolution will leverage data from myriad devices to bring new insights and enable new products and services. Around the globe, the smart buildings technology market will explode 16.1% over the next five years from a 2018 market size of $30.5 billion. In this webinar we will look at the changes inherent in the digital evolution as well as the infrastructure solutions that will support them. This webinar, presented by Jim Davis of Fluke Networks, will start with a basic review of the need for cleaning fiber and the differences between singlemode and multimode fibers. It will then cover the inspection and cleaning of fibers, the loss length and reflectance requirements, measuring loss, Tier 1 testing of MPO/MPT Connectors, Tier 2 testing for troubleshooting, and reading a test report. This webinar, jointly hosted by the TIA Fiber Optics Tech Consortium and the Association for Passive Optical LANs, will discuss Passive optical LANs (POL) technology, comparing POL and traditional Ethernet switching architectures, and reviewing the Telecommunications Industry Association (TIA) standards applicable to the design and testing of POL solutions to address considerations such as splitters, connectors and signals. As enterprise and data center networks migrate toward architectures that utilize multi-fiber connectivity such as MPO, standards bodies are releasing updates to incorporate these technologies into standardized structured cabling. This webinar provides an update on the revisions to industry standards to support multi-fiber connectivity and will explain how to implement testing procedures that will allow users to provide certification for networks with multi-fiber connectivity. Speakers will include Rodney Casteel, CommScope, and Ed Gastle, VIAVI Solutions. Attendees will earn one BICSI CEC for attending. Join FOTC Standards Chair Cindy Montstream for an update on structured cabling standards. Attendees will earn one BICSI CEC. There are many considerations when it comes to choosing your fiber termination method – from the number of connections and the application being supported, to performance and overall required time to go live. While pre-terminated fiber solutions offer significant benefits in terms of factor-terminated performance and ease of deployment, they do require proper planning and predetermining of lengths, as well as longer lead times. Choosing a field termination method like fusion splicing or mechanical splice connectors comes with its own set of additional considerations, including cost, required skill set and labor efficiency. This webinar will examine the various types of fiber termination methods available today, providing pros and cons of each method and basic considerations to help you choose the fiber termination that’s right for your specific fiber deployment, including key questions to ask and termination time comparisons and analysis. This webinar is approved for one BICSI CEC. This talk will explore the evolution of multimode fiber from inception to current time against the historical transceiver roadmap. We will explore various transceiver form-factors with respect to capability, technology risk, density and cost vs. fiber types that have been deployed (and those yet to be widely deployed). Both transceivers and supported fibers will also be discussed with respect to the evolution of standards that support them. Attendees will earn 1 BICSI CEC. This webinar addresses the drivers behind the ever-growng data center market and the standards that support that growth. Attendees will earn one BICSI Continuing Education Credit. Learn how to read the many fields on a fiber optic certification report generated by a field tester and understand how they will affect the applications you are planning to run. This webinar will review the advantages that ultra high fiber count ribbon cables can bring to data centers and campuses. Also covered will be splicing and connectivity options. This webinar is approved by BICSI for one CEC. Data Centers vary widely in nature and can be roughly classified as hyperscale, multi-tenant, and private. A critical and common component in the operation of such data centers is the installation and maintenance of the physical cabling infrastructure. A fundamental change taking place is the evolution from cables using classic connectors on copper (RJ-45) or fiber optics (LC) to cables terminated by pluggables such as SFP or QSFP. This represents a new challenge as these cables, called Active Optical Cable (AOC) or Direct Attach Copper (DAC), are not easily validated and tested. Attendees will earn 1 BICSI CEC for attending. Broadcast media is undergoing wholesale change due to demands from consumers, competitors, and creative opportunity for new types of content. Virtualization at multiple points of the distribution and delivery network is recognized as the only way to meet these demands. This webcast will review in detail the technologies involved in the virtualization of broadcast media, from network, to master control centers, to edge device delivery. Steve Reynolds is Chief Technology Officer at Imagine Communications and responsible for the technical strategy and roadmap of the company, as well as managing business development, partner relationships, and M&A activity. Reynolds brings 20 years of technology leadership in the cable industry to Imagine Communications. At Comcast, he served as Senior Vice President of Premises Technology overseeing the strategy, roadmap and development of all technologies employed in service delivery to the customer premises. Prior to Comcast, Reynolds was Senior Vice President of Technology at OpenTV Incorporated, a world leader in digital and interactive television technology. The Telecommunications Industry Association (TIA) TR-42 Telecommunications Cabling Systems Engineering Committee is issuing a Category 8 cabling systems update. Join this webcast to learn the details. Mark is one of the founding members of Fluke Networks, starting in 1993. He has been involved in all of the key areas of the business, including cable testing, network troubleshooting and analysis. He holds a B.S. in Computer Science and an MBA from the University of Washington. Frank Straka manages Panduit’s copper and fiber cable product lines. Frank holds multiple degrees in both engineering and business, including a BSEE, MSEE, and MBA. He holds 26 patents in copper connectivity and cable design. Frank is active in the TIA TR42.7 standards group, which developing new standards to support new applications like 25 and 40GBASE-T, 100W PoE++ and NBASE-T. He has spoken at multiple conferences such as BICSI, IWCS, and the Ethernet Summit on new copper developments. This program does not offer BICSI CECs.